The U.S. and South Korea on Monday began 10 days of large-scale joint military exercises, but a reduced number of troops and assets will participate this year. The United States and South Korea have begun 10 days of joint military exercises on Monday. But the exercises will have fewer troops, vehicles and other equipment than last year. Military leaders say these exercises, also known as war games, are needed to maintain operational readiness. But there are concerns that a show of force could again increase tensions in the region. The yearly US-South Korea war games are large military planning and coordination exercises. They are designed to respond to computer-simulated North Korean attacks. About 17,500 American troops will participate in this year’s exercises, along with 50,000 South Koreans. That is down from 25,000 American troops in 2016. Military leaders say these annual war games are needed to train new soldiers in the region. North Korean officials have long objected to the U.S.-South Korea joint military exercises. They have called the exercises “rehearsals for invasion.” Last year’s war games included planning military strikes to kill the leadership in Pyongyang. Recently, the U.S. and North Korea have exchanged strong language over possible North Korean missile tests. But North Korean leader Kim Jong Un reduced tensions by suspending plans to fire missiles toward the U.S. territory of Guam. A U.S. Air Force U-2 Dragon Lady takes part in a drill at Osan Air Base in Pyeongtaek, South Korea, August 21, 2017. 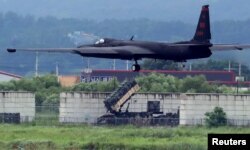 Some political experts suggest the United States seems to have responded to North Korea’s restraint by reducing the size of this year’s exercises. On Sunday, Defense Secretary Jim Mattis denied that North Korea’s objections were the reason for the reduced number of troops in this year’s war games. China and Russia have also called for the suspension of the joint military exercises. The countries also want North Korea to suspend its missile and nuclear tests. Brian Padden wrote this story for VOANews. Jonathan Evans adapted it for Learning English. Hai Do was the editor.